We would like to invite you to our joint event where we will discuss the options and opportunities and taxes for investing in Hawaii (USA). 1. Historical, current and future outlook of the Hawaii economy and real estate market. If you would like to learn more about the topics above, please RSVP to the link below and join us for light refreshments. Feel free to share this invite with anyone who is interested in Hawaii and other USA investment opportunities. Khai Tran is a Hawaii real estate agent at Coldwell Banker in Honolulu, Hawaii (USA). Khai’s energetic strength of mind, unparallel determination in providing superb service and a wealth of market knowledge are all valuable tools which give his clients a unfair advantage over the rest. 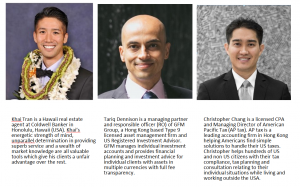 Tariq Dennison is a managing partner and responsible officer (RO) of GFM Group, a Hong Kong based Type 9 licensed asset management firm and US Registered Investment Advisor. GFM manages individual investment accounts and provides financial planning and investment advice for individual clients with assets in multiple currencies with full fee transparency. Christopher Chang is a licensed CPA and Managing Director of American Pacific Tax (AP tax). AP tax is a leading accounting firm in Hong Kong helping Americans find simple solutions to handle their US taxes. Christopher helps hundreds of US and non US citizens with their tax compliance, tax planning and consultation relating to their individual situations while living and working outside the USA. We’ve moved September 2017 – New Office Welcome Party Pics!